Sometimes it’s as simple as Twisted Sister said in 1984: I wanna rock. That sentiment held true for the nearly sold-out crowd that braved migraine-inducing traffic Wednesday to visit Lakewood Amphitheatre for the first concert of the season – a triple bill of ’80s hair band awesomeness in the forms of Def Leppard, Poison and Tesla. Headliners Def Leppard hits sheds around the country nearly every summer – and why not? They’re one rock’s most reliable road shows and consistently bring fans a parade of beer-hoisting anthems. This year’s stage show, tweaked slightly from last year’s wall of TV screens, nonetheless impressed with its ginormous video screen stretching the length of the stage and a light show worthy of KISS. Frontman Joe Elliott reminded the crowd about halfway through the band’s 100-minute set that Def Leppard is celebrating its 40th anniversary this year. Oof. Let that sink in for a moment. 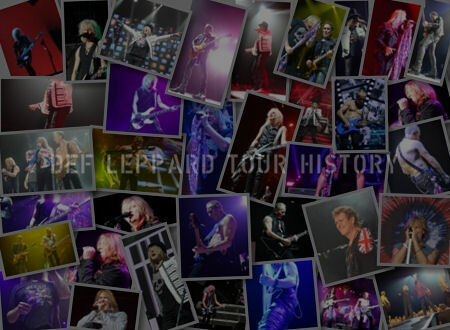 “What happened’ was largely on display Wednesday night with melodic run-throughs of “Animal,” “Armageddon It” and “Love Bites,” all featuring Def Leppard’s signature sweet harmonies. Drummer Rick Allen, snug behind his specialty drum kit in an outfit that meshed the American and British flags, pumped a steady beat on “Rocket” and helped lead the crowd through the expected roar-a-thon known as “Pour Some Sugar on Me.” Meanwhile, guitarist Phil Collen and Vivian Campbell laid their twin axe attack on “Let it Go” and “Foolin’,” which Elliott introduced by referencing 1983’s breakthrough “Pyromania” album – the mere mention of the classic disc was enough to rouse the crowd. Elliott’s voice contains a bit more grit, but his swag is what matters, and anyone who has rolled down the windows to sing along with “Let’s Get Rocked” knows that it’s all in the attitude. Professional party band Poison owned the second slot on the bill and quickly reiterated their position as one of the most fun bands to experience live. The original foursome of singer Bret Michaels, drummer Rikki Rockett, guitarist C.C. DeVille and bassist Bobby Dall, whipped through greatest hits including mighty power ballad “Every Rose Has its Thorn” and the lightly lascivious “Unskinny Bop.” What they do isn’t exactly high art, nor is it musically complex. But who didn’t want to play air guitar along with DeVille on “Talk Dirty to Me” or “Nothin’ But a Good Time”? Michaels is the perennial bar buddy, a gregarious guy who loves to slap hands with fans while stutter-stepping down a small catwalk. He’s also an earnest guy, and rare is the show that he doesn’t bestow kudos on military veterans and active service personnel as the lead-in to the ballad, “Something to Believe In” (“ALL politics aside,” he said from the stage, “this is what it’s about for me.”). Poison’s hour-long set, which featured plenty of lighting and instruments glowing that special shade of green, also included good old-fashioned solos from each of the musicians (DeVille has become a notably better guitar player than he was in the blackout ’80s). Michaels’ voice seemed in the wrong key during “Fallen Angel,” but he otherwise sounded reasonably strong, especially on the ballads. Not that this crowd cared one way or the other – they just wanted to raise their fists and dance. Singer Jeff Keith has maintained the gravelly edge to his voice, and guitarists Frank Hannon and Dave Rude added plenty of rock flair to the songs. 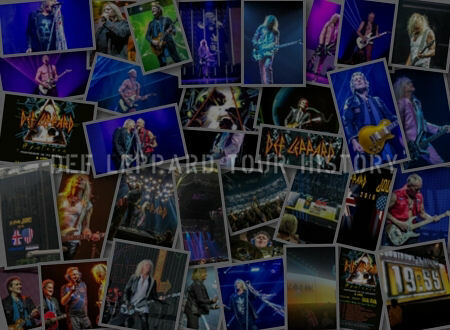 The band is reportedly working on a new album to be produced by Def Leppard’s Collen, a guarateed solid move. By ALC Music Scene 2017. Great concert co-headline packages are all the rage these days with two or three mega bands sharing a bill. In a world where all the 80’s bands we love are struggling to make a living from album sales, more and more bands are forced to earn their living playing live. This is a good and bad thing in my opinion. On the one hand, you get to see your favorite bands live, but on the other hand, it becomes less of an event if you are seeing the same show twice a year and causes forms of over saturation. Here is the other issue I have with these packages. I am not a casual music fan, which means if I like a band, in most cases, I like them for much more than the hit singles. I want to go see a band live for the deep album cuts, not the singles. This puts me in the minority at any show. When a band shares a co-headline show there is less time for each band, which means you are getting the hits or popular tunes and nothing else. Do I really need to see “Rock Of Ages” one more time? No thanks, please give me “Wasted” or “High and Dry (Saturday Night)”! This week, I went to see a fantastic package of Tesla, Poison, and Def Leppard. I love all of these bands, and despite what I said earlier, it was $30 bucks for lawn seats and a night filled with Rock and Roll, how could I refuse? It’s my addiction – sue me. The night started off with sucky Atlanta traffic and that got us to the venue a little late. I downed my glass of wine on the walk into the venue and prepared to rock with Tesla who was already on stage and into their very short 30-minute set. I still enjoyed songs like “Signs”, “Little Suzi”, “Love Song”, and “Modern Day Cowboy” before it was over, and they sounded great as always. Love me some Tesla! Now given the band has a shortened time frame I would think we could do without the obligatory guitar and drum solo. Nope, we got ‘em. Poison overall sounded great, but the background vocals were a bit lacking for me at times. The energy was good and the crowd loved them. After a short set change, they brought on the night’s closer, Def Leppard. First of all, the band look and sound amazing. The show is visually fantastic and the band sounds great. I saw them last year on this same tour and was hoping for a bit different setlist, but was not lucky enough to get that. Hey, guys! Same place less than a year later, would it kill ya to switch out 2 or 3 tunes? I can really appreciate that the band play and sing completely live without the aid of backing tracks. 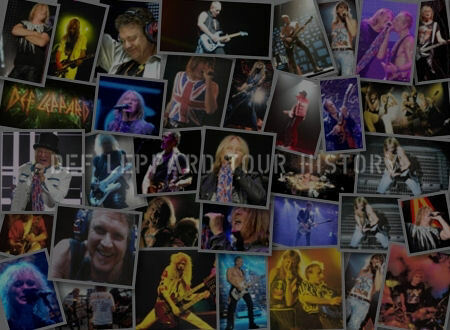 Many bands today rely on using backing tracks to help enhance their live sound, which is completely respectable given the technology available nowadays, but Def Leppard will have none of that. The band opens with a new track off the latest album called “Let’s Go” which to me is something that would have fit fine on the Hysteria album. They then launch into “Animal,” before getting to my favorite of the night which is that deep album cut I talked about earlier “Let It Go” from the High and Dry record. This is from an earlier period of the band’s career when they were more of a straight ahead hard rock band before becoming the polished pop-rock band we know today. 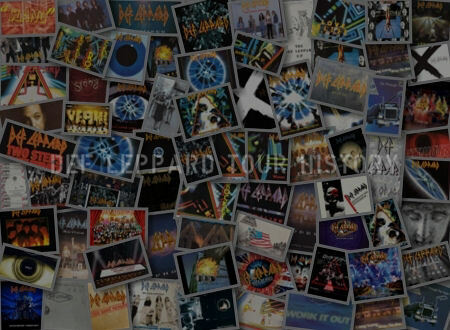 Each of these bands has been together for more than 30 years and most of the members are original except for Tesla and Def Leppard who each had to replace guitar players. That is pretty remarkable given this is Rock and Roll we are talking about. At the end of the night, fans get their money’s worth from these bands, and even if you don’t get to hear the song you were expecting, you get a night filled with “Lights, Sound, Guitars, Let There Be Rock” music! !